A Healthy, Simple, Sunny Life! I am on a quest to eliminate depression and anxiety! Check out my book to learn more. Pretty much everything you do contributes to your state of happiness and well being. This includes what you eat, think, and do on a daily basis. This blog is designed to provide specific ideas to become healthier physically and mentally, along with tricks to simplify your life to minimizes anxiety. Here's to a happier you! Depression and Anxiety have become an epidemic, affecting millions world-wide. Christian individuals are no exception. 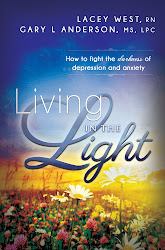 Living in the Light provides techniques to conquer feelings related to discouragement, anxiety, low self-esteem, or any other inadequacy. The book reveals the powerful combination of cognitive therapy mixed with gospel principles. It inspires one to rise above the darkness of this world by introducing analogies pertaining to the symbolic nature of light and dark. Although Satan is attacking people with his evil tool of discouragement, we can be prepared to fight back. Living in the Light will help you regain your life, your peace, and your happiness. Walk away from the dark...and into the light.